Verbena ‘Lavender Spires’ is a very hardy perennial that is almost constantly blooming! 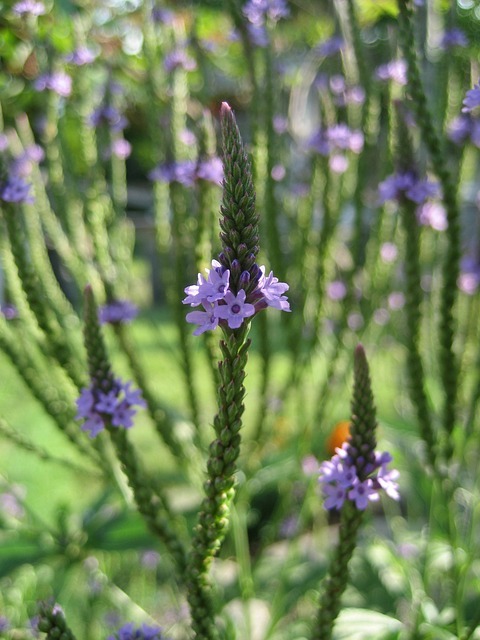 Growing 4’ or more tall with flower spikes elongating to 6”, Verbena ‘Lavender Spires’ is a show-stopper in the perennial garden. The flowers open gradually beginning at the base of the flower spike. Perfect for the cutting garden as they make wonderful cut flowers lasting a long time. Hardy in zones 3-8. Before storing your rototiller for the winter months, be sure to perform its necessary annual maintenance. Change the oil, drain the fuel or add a fuel stabilizer to the gas tank, remove soil from the tines and remove grit from around the engine parts. It will be ready to go once the busy, spring chores arrive! Store pest and weed-control products in their original containers in a locked cabinet for the winter months. The area where these products are stored should remain above freezing. If you plan to allow parsnips to remain in the ground over the winter, apply several inches of soil over them. Plan to harvest them early next spring before the new shoots emerge. If your plan is to harvest them throughout the winter months, a 1’ deep layer of straw is all that is needed. To help with weed control next season, avoid using raw animal manure or hay in any garden beds. Hay and most animal manure contain weed seeds and should be thoroughly composted before use. Horse manure should be avoided altogether. Plan your winter pruning any time as long as the trees and shrubs are leafless. Pruning in stages is best. Begin by removing any dead or diseased wood and then removed weak or crossing stems (which have a tendency to rub on one another). Finally prune to shape the plant. Remember that all cuts should be at an angle slanting slightly above and away from a bud or lower branch. The herb, turmeric, has been credited with relieving inflammation. Try a cup of turmeric hot chocolate to get a dose of this healthy herb! In a small saucepan, bring ¾ of a cup of milk to a simmer. Remove from heat and whisk in ½ cup (3 oz.) chopped organic white chocolate bar, such as Green & Black, until melted. Whisk in ½ tsp. of turmeric and 1/8 tsp. of ginger. Sip and enjoy!